Leitz Photographica Auction will host its 34th auction featuring a selection of rare Leicas on June 8. Leica 250 Reporter GG. With a Leica-Motor MOOEV. A Leica MP-2, the first M camera with an electric motor drive, produced in the late 1950s. It is considered to be one of the rarest and most unusual M cameras ever to have been offered for sale by auction. A Leica M3 No.700005, the fifth Leica M camera ever made and is probably in the best condition of any early camera of the series. A Leica 250 Reporter GG with a Leica-Motor MOOEV, so rare that it is estimated that only 15 examples have survived until today. Most examples of this camera were delivered during World War II and were lost in the chaos of war. The camera offered here was delivered to Berlin in November 1942 and is in excellent condition with only minimal signs of wear. For more information visit Leitz Photographica Auction~ and see the news release below. 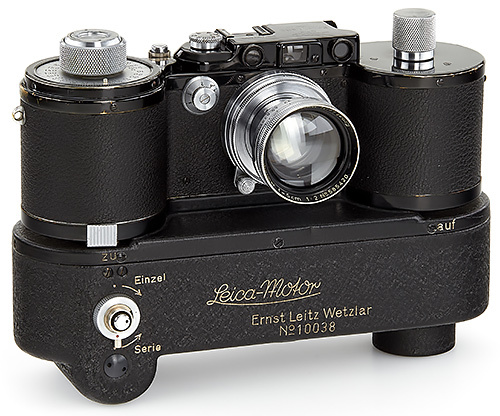 Leitz Photographica Auction, formerly known as WestLicht Photographica Auction and one of the world's leading auction houses for classic and vintage cameras, will be hosting their 34th auction featuring a selection of truly incredible collector's pieces on June 8. As you may have heard, a rare example of the Leica 0-Series produced in 1923 was a sensational highlight at the auction in 2018. The camera achieved a record-breaking hammer price of 2.4 million euros and still holds the record for the highest price ever paid for a camera sold by auction. This is the first M camera with an electric motor drive, produced in the late 1950s. It is considered to be one of the rarest and most unusual M cameras ever to have been offered for sale by auction. The fifth Leica M camera ever made and is probably in the best condition of any early camera of the series. It is one of the rarest and most valuable cameras manufactured by Leitz/Leica and it is estimated that only 15 examples have survived until today. Most examples of this camera were delivered during World War II and were lost in the chaos of war. The camera offered here was delivered to Berlin in November 1942 and is in excellent condition with only minimal signs of wear.